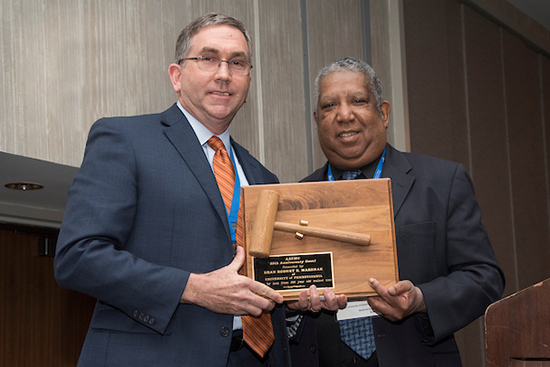 Dean Calvin Johnson, left, is presented the gavel of office by out-going AAVMC president Dr. Phillip Nelson, dean of the College of Veterinary Medicine at Western University of Health Sciences. Dr. Calvin Johnson, dean of the Auburn University College of Veterinary Medicine, has assumed his duties as president of the Association of American Veterinary Medical Colleges (AAVMC). His election was during the annual meeting held this month in Washington, D.C.
Dean Johnson had been serving as president-elect of the organization. AAVMC by-laws call for the president-elect to assume the senior leadership position following a year of service as president-elect. About 265 educators gathered at the 2018 AAVMC annual meeting to consider innovations in teaching and assessment, health and wellness, and international academic veterinary medicine. 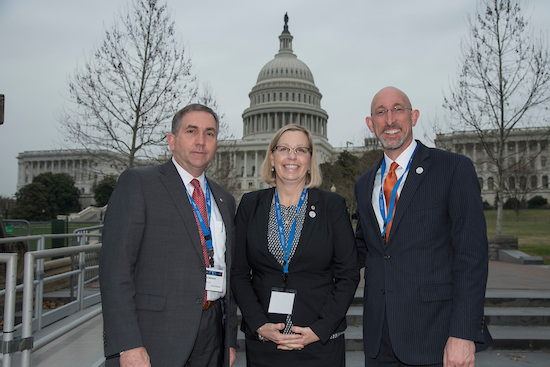 Dean Johnson, left, and Dr. Dan Givens, right, associate dean of academic affairs at Auburn University College of Veterinary Medicine, joined with Dr. Vicky Owens McGrath ’94 of Bowling Green, Ky. on Advocacy Day. Dr. Johnson represented the Alabama Delegation, while Drs. McGrath and Givens represented the Kentucky Delegation. On Advocacy Day, held on the day prior to the meeting kick-off, 72 educators representing 27 states made the trek to Capitol Hill, where 138 meetings were held with scores of Congressional offices. And almost 30 scientific posters describing scholarly work in academic veterinary medicine were featured. Washington, D.C., March 15, 2018 ­– Innovation in education was the theme of this year’s Association of American Veterinary Medical Colleges (AAVMC) annual conference and it didn’t disappoint. Most of the 265 educators attending returned to campus with fresh ideas and new perspectives on technology, assessment, multicenter collaboration, international academic veterinary medicine and a host of other topics. International experts presented dozens of talks that spanned the arc of teaching and learning. Presentations ranged from a virtual reality excursion through a dog’s circulatory system to an examination of how our counterparts in human medical education handle quality assurance in professional education. But the major news from the conference was the introduction of a new Competency Based Veterinary Education Framework (CBVE) that was more than two years in development and informed by work done in other health professions. The work has the potential to anchor transformational change in curricular development and assessment. Registrants also heard from the Principal Deputy Director of the National Institutes of Health (NIH) on Friday afternoon. Dr. Lawrence Tabak presented an overview of the NIH that focused on three general areas: 1) the large multidisciplinary collaborations required to advance biomedical research in the era of genomic medicine, and 2) the need for increased rigor and reproducibility in scientific research, and 3) growing areas of convergence and collaboration between human and veterinary medicine. U.S. Secretary of Agriculture Dr. Sonny Perdue, the first veterinarian to ever serve in that post, was scheduled to present remarks during the Friday afternoon plenary session, but a last-minute scheduling conflict prompted him to send video greetings instead. Friday afternoon’s plenary session wrapped up the afternoon with a dynamic presentation from University of Maryland – Baltimore (UMBC) President Dr. Freeman Hrabowski. The Civil Rights Movement veteran and noted STEM advocate delivered a rousing address on the need to create opportunities for women and underrepresented minorities in the 21st century workplace of science and technology. Hrabowski dazzled his audience with facts and figures about the modern landscape of education in society. All of it made the case that society needs to do a better job of providing opportunities for underrepresented minorities and women in the world of work – particularly in engineering, computer science and the so-called STEM areas. Hrabowski has backed up that premise with action: the UMBC has become nationally recognized for the number of students from all racial, ethnic and economic backgrounds that go on to pursue doctoral degrees in science and technology. They also place more graduates with organizations like the National Security Agency (NSA) as well. The AAVMC is a nonprofit membership organization working to protect and improve the health and welfare of animals, people and the environment around the world by advancing academic veterinary medicine. Members include 49 accredited veterinary medical colleges in the United States, Canada, the Caribbean Basin, Europe, Australia and Mexico.